The MHF is a revolutionary traction battery charger, designed for conventional, opportunity and rapid charging applications. It is based on a new hybrid power conversion technology, featuring an unprecedented combination of very high efficiency, unity power factor (PFC), universal capabilities and precise charge control. This system offers very high electrical efficiency, near unity power factor and very low output current ripple, moreover it features a real universal charging capability: multivoltage, multi-current, multi-application. REDUCE ENERGY USE AND CARBON EMISSION. 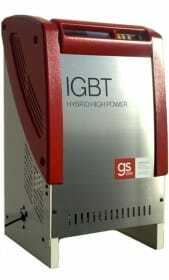 High frequency switchmode converter, based on IGBT technology. The charging curve is programmable for any battery type, including Lithium technologies. When used with Lead-Acid batteries, the ultra-filtered output current and the unique control algorithm ensure a perfect mixing of the electrolyte (without using air-pumps), while reducing the water consumption and the temperature rise of the battery, as well as the energy consumption. The MHF is controlled by the new digital board Amperis, equipped with alphanumeric display & keyboard, Charge History Logger, Programmable Real-Time Clock and Calendar, Audible Alarm and Connectivity package, compatible with wireless Battery Identification Modules, and the WEB based Fleet Management System DoctorFleet.com. 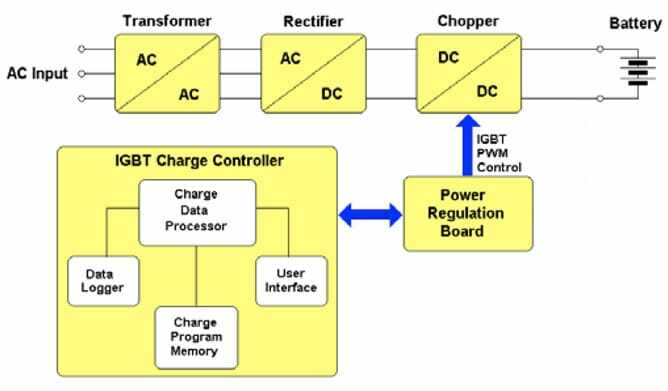 With the control board G-01, the programmable features of these chargers are almost infinite. True universal charger: Multi-Voltage, Multi-Capacity, Multi-Chemistry. Nominal battery voltages from 24V to 120 VDC. 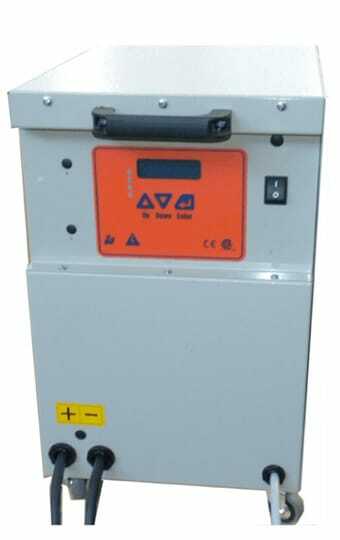 Completely programmable, can support batteries of any type, voltage, capacity. If the battery voltage is outside the acceptable limits, or the polarity is reversed, the charger remains in stand-by mode and gives error/warning message. Complete protection in case of output short circuit or overload. WITHOUT AUXILIARY WIRES: When the battery is connected, no arcing is generated at the connectors. If the battery is disconnected while it's being charged, arcing is possible, so it's necessary to turn off the charger before to disconnect the battery. WITH AUXILIARY WIRES (RECOMMENDED): Full Anti-arcing protection in case of battery disconnection, even while the charge is in progress. Every time the unit is powered, an automatic self-test of the power electronics and the control boards is executed in less than 10 seconds. In case of fault, the unit remains in safe stand-by mode and gives fault messages. If the battery is disconnected while the charge is in progress, the charger turns-off automatically within 3 seconds and a specific message is saved in the Charge History Log. An independent safety timer turns the charger off in case of malfunction of the main control unit. Alphanumeric LCD Display + LEDs, membrane keyboard and Audible Alarm. (*) = Reported Efficiency and Power Factor values are AVERAGE values, measured over the entire charging cycle. Peak Efficiency and Power Factor are higher.